Being able to reliably call your dog to come to you is one of the most important skills that your dog can develop. It’s very possible that a solid recall could one day save his life! Unfortunately, it’s also one of the most difficult skills to establish. There are just so many interesting things in the world to see and sniff! At Dog Training Now, we believe that building a solid recall is very much a building process! During training, we teach your dog the concept of the word “Come”, but we start from a short distance and with minimal distractions. Getting your dog to understand what is expected of him when you say “Come” is the first step. Once that has been established, only then can you begin to challenge your pup to come to you from a distance and with distractions. We’d like to give you some tips to establish a solid recall! Your dog should see you as a provider, a leader, and a friend, and the hallmarks of those relationships are mutual respect, trust, loyalty, and love. If you have a strong bond with your dog, he’s much more likely to be willing and interested in coming to you when you call him. This is a critical, but oft overlooked contributor to a solid recall. Being a provider means that you give your dog food, water, attention, and love, but without being a butler! Being a leader means asking your dog to work for every resource that he gets, even if it’s a simple sit for food or play. Being a friend means treating your dog with respect, and showing your affection. Don’t expect that you can release your dog into the backyard, say the word “Come”, and expect him to come happily trotting your way! During training at Dog Training Now, we ask your dog to come to us from a short distance with minimal distractions, and then automatically sit when he gets to you. This is how we establish what we’re looking for when we issue the “Come” command. When your dog reliably comes to you from a short distance, then you can begin to add distance and distraction. Lay the foundation first! You’re asking your dog to do something that he really doesn’t HAVE to do because he’s not on a leash. You have no way to MAKE him come to you, so you’d better establish that coming to you is going to be rewarding for him! Sell yourself! When you’re trying to get your dog to come, say his name to get his attention, and then issue the “Come” command. The moment that your pup even hints about moving towards you, or even looks at you, go over the top with love and praise, and don’t be afraid to look silly. Your neighbors may laugh at you, but your dog will find you more interesting than that squirrel he was chasing. Continue praising him all the way back to you. You may feel that you look ridiculous, but it will work! When your pup gets to you, you’ve got to deliver what you were selling. After he sits near you, you can release him with “Ok” and then have a huge celebration! He did exactly what you asked of him, and he deserves to be rewarded for it. You might even choose to reward him with treats when he gets to you, however he shouldn’t get treats every time, and definitely don’t use the sound of the bag of treats to get him to come to you in the first place. We wan’t him to come to you, not the treats! If you’re simply practicing the “Come” command, try to release your dog with “OK”, give him his celebration, and then let him go back to what he was doing, which is even more rewarding! When you issue the “Come” command, as far as your dog is concerned, you have a good reason. You’ve asked him to come to you because you need him for some reason, maybe even to save him from harm. Allowing your dog to think about if he’d like to come to you for a few seconds will prevent the skill from being as dependable as you’d like. 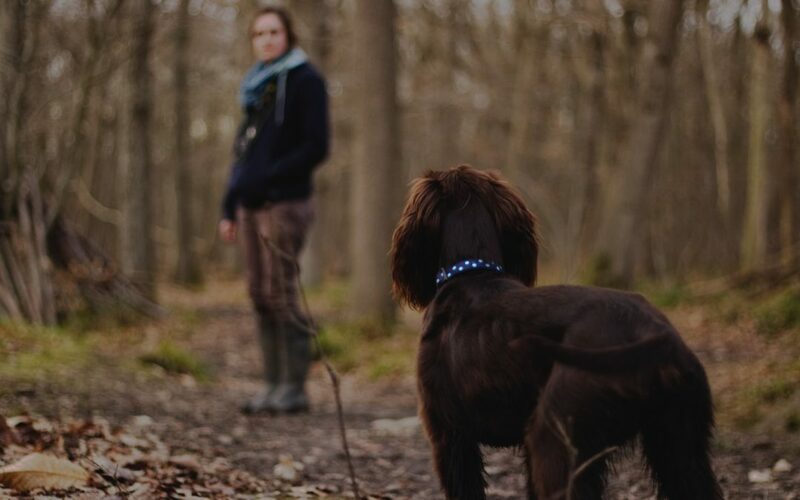 If you issue the “Come” command and your dog chooses to ignore you even when you’re selling yourself, we recommend putting him on a long leash in the backyard, so that you can communicate with him from a distance. Or consider enrolling him in our advanced off-leash training program where you’ll be able to communicate with him form a distance. If he chooses to ignore you, you’re able to give a small correction timed with “No, Come”, and then as soon as he realizes that you’re serious, go right back to selling yourself. However, it’s very important that you avoid using harsh tones or gestures. Nervous dogs will often slow down, crouch, or worse yet run in the opposite direction. It’s important to focus on being positive, and if you must use a leash correction to get him moving towards you, it should be the minimal correction necessary to get his attention, followed immediately by selling yourself again! As with all of your dog’s skills, practicing and applying the rules consistently is key. He is required to respond to “Come” every time that you ask him, and if he chooses not to, take the difficulty level back down to re-establish the foundation. A reliable recall can be established for all dogs, it just takes time and practice, but it’s time well spent! All of our training programs work on establishing a solid recall. Call or email us anytime to start! This sounds great and I could be interested. What would be the average number of sessions and cost for a 20 pound 4 year old Bichon Frise? We used Dog Training now when Dunkin was a puppy.